[BB-Blog]: The Skylark LTD laptop bag. The Skylark LTD laptop bag. 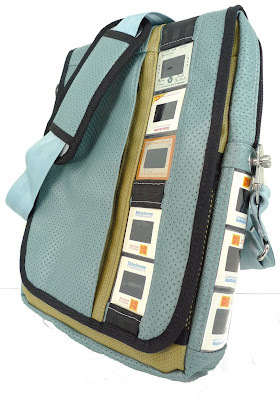 Now THIS is a great laptop bag. Want. The Skylark LTD. is RedCampers first laptop bag featuring a vertical fit, padded insert, magnetic closure, multiple pockets, adjustable strap, recycled airline seat belt clips, 1970’s vintage car upholstery and real authentic vacation slides from someones “don’t cross that line or you die” road trip. Fits 15" and smaller laptops.